It’s been a while since I’ve read a book like this — a book that I finish, only to think, I’m missing something…there’s so much stuff going on here that’s going right over my head. But I think that’s a good thing when it comes to this novel, because King doesn’t explain every last thing. Instead, he makes connections (such as putting red ribbons everywhere — on skulls, in Auntie Cassie’s suitcase, in Rebecca Neugin’s hair) and leaves them for the reader to interpret. Sometimes this is nice, even when it does go over my head. It leaves me thinking, curious about the relationship between various characters and themes.That being said, I was really upset when (*plot spoiler! *) Soldier died at the end. Of course, King gives us the option of reading it as something other than a death, what with Lum’s body being found but not Soldier’s, but I was still upset. I just knew he was going to kill that poor dog off once I read Chapter Twenty-Three (the one all about Soldier — his puppyhood, how he got his name, etc.). However, like much of the novel I’m still trying to decide exactly what to make of Soldier’s demise.I thought Monroe was one of the most fascinating characters in this novel. Besides the fact that he is alternately wigged and not (bald? ), in a wheelchair and ambulatory, crazy-sounding and sensical…well, he’s just such a mystery. How did he get to be so rich when he was busy getting fired from job after job? What did he mean when he said the Horns were the center of the universe? What’s going on with his art installments — the metal buffalo who appear to be moving and sometimes seem real, the church that disappears so completely into its surroundings that it actually gets lost, the box full of the bones of Indian children stolen from forgotten drawers in museums? And what the heck is the truth about his past with Auntie Cassie and Tecumseh’s mom? He’s a big mystery, and one that I enjoyed slowly piecing together (even if I didn’t solve him, per se).The novel was, in my opinion, not as good as Green Grass, Running Water, but it was a really good read nonetheless. 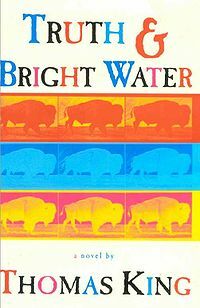 I’m not sure Thomas King is capable of writing a dud, and Truth & Bright Water is evidence of his skillful storytelling abilities.